We are now less than 24 hours away from the opening event of the UK Asian Film Festival – be there with us! A LEGEND in her own right, one-time starlet, later talk show host and now irrepressible ambassador of Indian cinema, Simi Garewal is not to be missed. 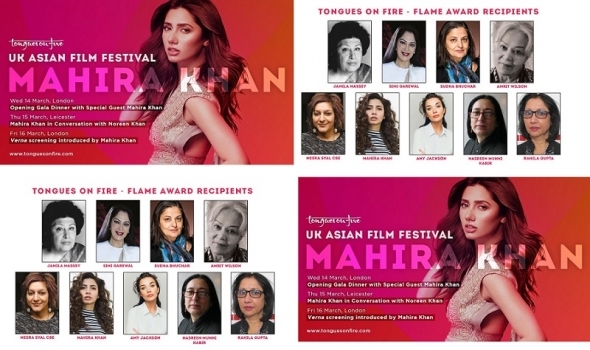 She will grace the launch of the UK Asian Film Festival, which opens tomorrow (March 14) with a glittering red carpet at 7pm, followed by an awards ceremony and black-tie dinner at the May Fair Hotel in central London. Garewal, who famously shocked India for a scene in the western film, ‘Siddhartha’ (1972) alongside Bollywood legend and pin-up, Shashi Kapoor, will just be one of nine women receiving Tongues of Fire Flame Awards. Garewal told festival organisers she was excited about helping to launch the festival tomorrow. She said: “I am looking forward to it a lot. I have not been to the UKAFF before, so I don’t know what to expect, but I am happy to meet people who are as fascinated by cinema and film making as I am. “Festivals give film people a platform to interact, to discuss, to share experiences. “It brings actors and directors closer to movie loving audiences and vice versa. Along with Mahira Khan, whose one foray into Indian cinema, ‘Raees’ (2017) announced a major and versatile talent (scuppered only by the complex politics of India-Pakistan international relations) and Amy Jackson, the British siren casting a spell in Indian cinema for a few years now and trailblazing again in US TV series ‘Supergirl’ and Garewal will be the ones attracting the most frenzied attention. Make sure you’re connected with us as we cover the festival, starting tomorrow live on the red carpet on Instagram and Twitter and make sure you’re subscribed to see our video interviews the next day on our Youtube Channel.